It has become cliché to mention, in previewing the Atlanta Braves, that Bobby Cox' crew has not made the playoffs two years in a row. I will succumb to this need to pander to the cliché: the Braves have not made the playoffs in two years. The Braves have been fond of saying "we do not rebuild, we reload" in the past, and this year might be the greatest test of Atlanta's sustained excellence, as it might be the end of the line for Bobby Cox, John Smoltz, and Tom Glavine. Are they primed to make it special season in a stacked NL East? His numbers last year were hurt by a hand injury that plagued him early on in the season, and his numbers in 2006 are an unlikely bet to be repeated in 2008. So what can we expect from Brian McCann next season? Simple: something in between, which would still represent excellent production from a catcher. Thirty doubles, twenty homeruns, and ninety RBI would be realistic figures to expect from McCann, and he should provide fine defense up the middle for his pitching staff. Recently cut/retired Javy Lopez will not serve as McCann’s backup as planned, leaving competition between relative unknowns Brayan Pena, Clint Sammons and Corky Miller for that role. Teixeira, barring poor health, is almost a lock for thirty homeruns, 100+ RBI, excellent defense and 70 walks. His production offensively and contributions defensively should be well above-average, and the Braves will not have to worry about the black hole they had at first base to start the season last year. Johnson's good batting eye and plate discipline alone make him a formidable top of the order hitter for the Atlanta Braves, especially with their strong 3-4-5-6 spots, and he will be among the league's best at second base if he can continue the progress he made last year. It'll be his third time up with the big league team, so there is certainly room for him to regress, but he should be a solid piece in the Braves' puzzle. Larry Jones has re-emerged as one of the premier third basemen in baseball over the last two seasons, but there's reason to believe he will decline. He will still be productive, but I have doubts that he will be as "healthy" as he was last year because he always finds ways to injure himself, and he is getting up there in years as well. Where will he land, offensively? I doubt he hits less than .290, gets on base less than .380 or slugs less than .550. I am hoping to err on the conservative side. But I would not be surprised if he hit well over .300, got on base at a .400 clip and slugged over .550. If he's healthy, he should be very good. Here I am conflicted as a prognosticator. Edgar Renteria is a fine baseball player. Nothing exceptional, but he is a good player to have, and I am inclined to suspect that he will be missed. Yuniel Escobar, however, played quite well last year, and I am not inclined to doubt the Atlanta Braves in their scouting and player development. What I saw last year out of Escobar, when Renteria went down to injury, was good defense, a good approach at the plate, and a strong, level swing that should produce a fair amount of doubles. Still, this might be the position of which I am most unsure. Some people feel that the Braves will really miss Andruw Jones when he is gone. Braves fans already do. I, for one, say good riddance to a lazy, undisciplined, and ballooning hack. Yes, his defense was still good (damn good, in fact) but he was becoming an embarrassment and a liability at the plate. 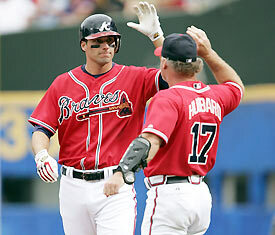 The Braves signed Mark Kotsay in hopes that he could provide consistency at the plate and good defense in the field. If he fails, Jordan Schaefer, Atlanta’s #2 overall prospect as ranked by Scout.com, could replace him adequately. I, for one, expect Kotsay to be more in line with years past than last, and expect him to contend for Comeback Player of the Year. Even if he does not live up to my lofty standards, he should do well enough, as his defense is good and he'll be batting towards the bottom of the order. I expect Francoeur to continue hitting around the average he reached last year, and possibly to improve upon it now that he has seemingly figured out the strike zone and understood that hitting takes patience. I would bet money on his power numbers improving significantly, if I were the kind of man who bets on baseball. But I'm certainly willing to predict it. And Matt Diaz? Whether as a platoon player or an everyday man, Diaz can certainly be counted on to provide a good deal of walks and hits. The departure of Saltalamacchia and promotion of Escobar weakens this bench significantly. Lillibridge, acquired in the Adam LaRoche deal, could step in as the primary backup at both centerfield and shortstop despite putting up pedestrian offensive numbers above Single-A. Infante, Thorman, and Borchard were each among the worst hitters in baseball last season. This year's rotation is leaps and bounds better than last year's, but it is built upon shaky foundations that might not hold up the whole season. John Smoltz is still a top ten starter in the National League, maybe even a top five starter, but he is a significant injury risk. Tim Hudson will be fine next season, and that's all there is to say about the Tiger from Auburn. 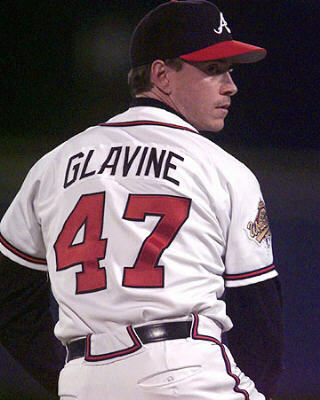 Glavine is aging, but he is still adept at providing quality starts and that is all the Braves will need what with their excellent offense and shutdown bullpen. Mike Hampton will not pitch the entire season, and I doubt he throws over a hundred innings. What he will provide will be a few good innings, nothing spectacular, and a lot of snickering in the NL East when he gets injured again. Jair Jurrjens is a capable, talented young pitcher who should be good enough for all he's asked to do: keep the Braves in games at the fifth spot. Atlanta has a fair amount of depth in their rotation, from Chuck James to Jo-Jo Reyes in the event that these pitchers get injured or prove ineffective, but the Braves and their fans should be hoping for Smoltz to remain healthy more than any other player. Peter Moylan should continue to be a strong middle relief pitcher and possible setup man, with some whispering that he is capable of making it as a closer. It is certainly possible, as closing short-term only takes adequate stuff and nerves of steel. But Rafael Soriano should be a strong closer for the Atlanta Braves, Will Ohman should be the LOOGY they have been looking for for awhile now, and could be joined by Mike Gonzalez after the All-Star break. Bobby Cox is a master at determining whether his pitchers have it or don't and keeping his team in the game. These Braves can do significant damage in the NL East next year. Their offense will again be amongst the league's best at scoring runs and the pitching staff has tons of potential. But there would be little surprise if their best years are behind them and they wind up in second or third place. At the least, they should be strong contenders for the Wild Card, but do not discount them: the Atlanta Braves are for real, and if a lot of things go right for them (not everything as they can survive injuries to several of their players) they will surprise a lot of people who are looking past them.